What is common amongst all of these – Rasam saadham, Thayir saadham with pickle, Kichidi, Dal chaawal, Mashed potatoes, Mac n Cheese, Maggie/ramen noodles, Toasted bread, Chicken soup? Well, depending on whether you are from Mylapore or Andheri or Brooklyn or where ever it be… one or more of these dishes would bring back soothing memories of a childhood meal, mama’s quick fix or that which you long to eat after days of binging… it’s your very own COMFORT FOOD! Needless to say, I have my own share of dishes that evoke that nostalgic element within and take me on trips down memory lane all the way back to my grandmother’s kitchen… Mor Kuzhambu is right on top of that list! From the perfect blend with just the right shade of yellow to a curdled mix that is too thick to pour, I have had it all! Though it is such a simple mix of spices and can be put together well before you are done listening to 2 or 3 Rahman songs, it is quite easy to mess this simple dish and trust me when I say that! Here is a tried and tested recipe to help you get it right. 1. Add about 2 cups of water to the yogurt to make into thin buttermilk and mix well so as to not have any lumps of curd. Add salt to taste. 5. Cook on medium-low flame with constant stirring until you see the first signs of a boil come up and then remove from heat and garnish with coriander leaves. * The tempering can be done in the end to give a nice aromatic flavor and pep up the presentation – in this case you would just cook the vegetables separately by boiling or sauteing (in the case of okra) and add to buttermilk mix and bring it all to the near-boil stage and remove from heat. Then do the tempering separately on a pan and add to this cooked curry and serve right away! 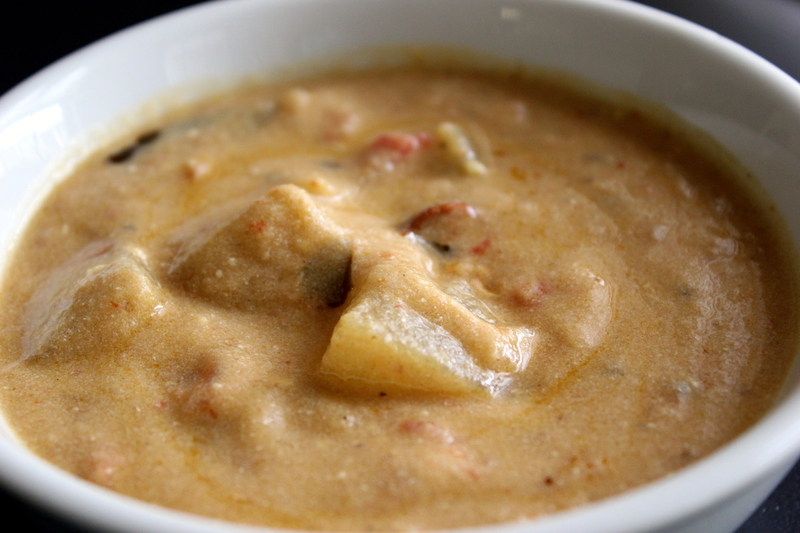 * The curry can be made plain without any veggies as well for a quick fix. I love it simply with just tomatoes which add to the tanginess! This dish is best eaten freshly prepared and hot. But if you do need to reheat any leftover curry, the preferred method would be to microwave or steam cook in a cooker or double boiler. Direct heat can alter the taste and may also cause a curdling effect.